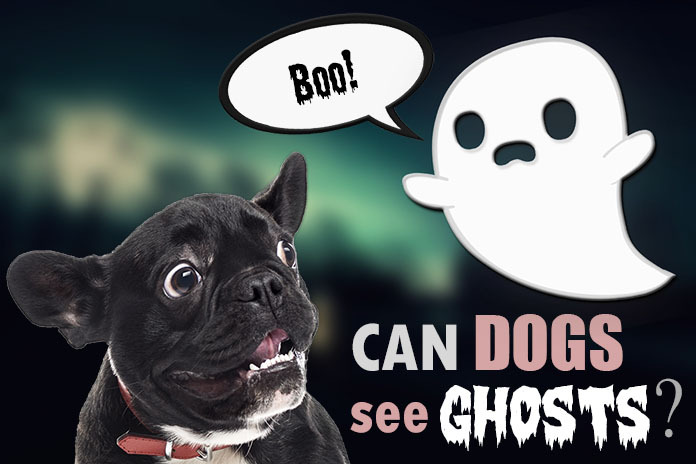 Home Training & Behavior Can Dogs See Ghosts or Spirits? Spooky! Ever think your dog where it seems like they have sensed something you can’t? There's some proof that they can. How Can Dogs Sense the Supernatural? Before delving into some of the proof that dogs can indeed see ghosts, let’s talk about what makes Fido capable of this miraculous feat. Dogs, like most animals, have senses that are far more heightened than humans’. First off, smell. The olfactory area of a dog’s brain is 40 times larger than a human’s, meaning they can “identify smells somewhere between 1000 to 10,000 times better” than we can. Then there’s their hearing. We know dogs have excellent ears just by how they can alert us to an oncoming storm still hours away. Dogs can also hear noises that are above and below the hertz human ears can detect, meaning that those supernatural clicks and squeaks we can’t hear aren’t easily disregarded by your pet. Lastly, something dogs and people share is a sensitivity to touch. Not only is touch a socializing mechanism, it is one of key factors in “feeling” a supernatural presence. Humans and dogs alike will bristle when something dark or mysterious is looming, even if we can’t see it. What are the Signs of a Spiritual Encounter? There are a couple signs that you are within proximity to something or someone unseen that are undeniable: the footsteps belonging to no one, the DOPler Effect (Disappearing Object Phenomenon), the slamming doors, flickering lights, electronic devices with mind of their own, or the scent of someone long gone from this world. But one of the biggest, most crucial things for confirming whether or not you are experiencing a haunting is the reactions of your animals, namely cats and dogs. Pet Psychologist Marti Miller explains why dogs might react more to the supernatural than humans do. It turns out, and it’s because dogs are more in tune with nature. “Sensing the supernatural is natural because they don’t judge it. People could see auras and spirits, but they either don’t believe they exist or think that if they do exist, we could not see them,” Miller states. Of course, the extent of just how much of the spirit realm dogs can see is based on the individual. Similar to people who can and cannot get in touch with the supernatural, dogs share like capabilities. Some may behave erratically. Others might bark then let it go. What might really matter is the connection your dog has with you. There was an i﻿nteresting experiment done about the psychic connection to dogs and their human companions done by biologist Rupert Sheldrake. 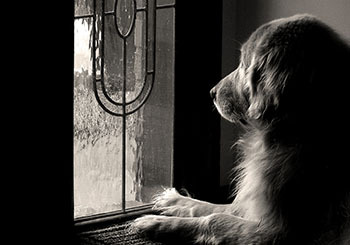 His findings concluded that due to some extrasensory perception, dogs were not surprised by the arrival of their owners, even during unusual hours. However, whenever a stranger entered, those dogs behaved quite differently. Many incidences where dogs sense something amiss, they react with barks and growls to try alerting their owner or social circle to the danger. 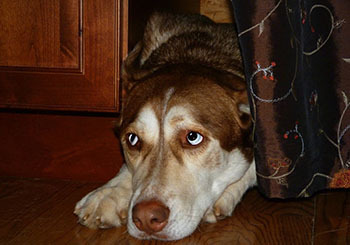 Others detail dogs staring fixedly at walls or under a bed and growling. Whenever the owner comes in and tries to figure out what is wrong, the dog wags its tail but remains somewhat distracted. One ghost story brought up by Stephen Wager, a paranormal phenomenon expert, provides further proof of this. A young woman he interviewed reported to Wager that her dog Haywood who was lying at her feet began to growl. Tuscon, her another dog, went and hid. She felt a gust of cold air, and [Haywood] continued to growl. Elven, the young woman, ventured around the house, following her dog Haywood. Then, “a little girl’s voice come from the vent in the floor next to me.” The girl and her dog took a seat on the couch. Her faithful companion continued to protect her from the presence, growling all the while. While some people might simply dismiss these odd behaviors as hearing mice in the walls or smelling something from outside, the possibility of it being an unseen presence should be considered. That is up for you to decide! I personally think that they can. Some of my animals have displayed the noted behaviors. My grandmother’s dachshund used to stare at the vacant seat where my grandfather would sit and watch TV with his ears perked forward then randomly bark and wag his tail. Do you think dogs can see ghost or sense spirits? Or do you have any spooky dog stories to share? Share your stories with us in the comments!